SAN DIEGO, July 21, 2010 -- Some of the oldest aerial targets in the U.S. Navy's inventory can now be used for some of the service's most advanced training missions thanks to the recent on-schedule completion of an avionics upgrade of those targets by Northrop Grumman Corporation (NYSE:NOC). 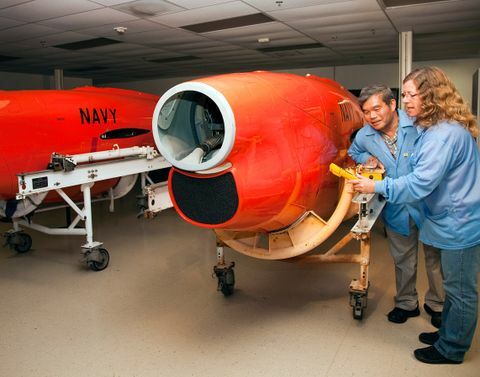 In late June, the company completed deliveries to the Navy of 25 BQM-34S Firebee aerial targets, each one retrofitted with modern avionics hardware from the service's primary target system, the Northrop Grumman-produced BQM-74E. As part of this Avionics Upgrade program, Northrop Grumman also provided updated operational flight program software, training of Navy personnel and flight test support. "This upgrade program converted 25 targets that were nearly obsolete into state-of-the-art systems that will meet the Navy's most critical training system requirements for many years to come," said Hans Dall, program manager of the BQM-34 Targets Program for Northrop Grumman's Aerospace Systems sector. "The BQM-34Ss can be operated with the Standard Navy Target Control command and control system, and will allow the Navy to carry larger payloads than the BQM-74E in a system that delivers the proven performance of the BQM-74E." Aerial targets are unmanned, aircraft-like systems used by the military to simulate tactical threats posed by enemy aircraft and missiles. They are typically used to test and evaluate surface ship defensive weapons systems or to train pilots in air-to-air combat techniques. According to Dall, the new avionics and software added to the BQM-34Ss give the targets fully autonomous waypoint navigation and an improved ability to perform intricate maneuvers at extremely low altitudes. "The BQM-34S Avionics Upgrade program is a great example of Northrop Grumman's expertise in migrating the capabilities of one unmanned system to another unmanned platform using proven hardware technology and only minor software changes," said Steve Mastin, director of target programs for Northrop Grumman's Aerospace Systems sector. As another example, Mastin cited the company's current work with Bell Helicopter developing and flight testing a new medium range vertical unmanned aerial system (VUAS) called Fire-X. Fire-X will integrate the proven unmanned systems architecture of the Navy's MQ-8B Fire Scout VUAS with the mature, FAA-certified Bell 407 airframe. Northrop Grumman is the Navy's prime contractor for Fire Scout. The BQM-34 Firebee is a versatile, highly reliable aerial target with a top speed of Mach 0.97, and an operational altitude envelope ranging from 10 feet above the sea surface to 60,000 feet. It can perform seven-g turns while maintaining high airspeeds for realistic threat presentations. It features a modular, robust design; large internal and external payload capacity; and abundant electrical power, allowing it to support a variety of specialized target and tactical unmanned aerial vehicle missions. It has been in service with the U.S. military for more than five decades.